Mariam Integrated Venture Limited is a division of ROTECH AUTOMOBILE & REAL ESTATE ENTERPRISES LIMITED.Just as Rotech Mariam is a well established corporate and experienced indigenous company, whose major services range from Oil and Gas, Property Sale and management, and Real estate in General. .
Mariam Integrated Venture Limited has over the years acquired a very sound reputation in terms of competence and performance. It is at the forefront of a major property management throughout the nation, with an immense capacity to step up and plug in all the required resources when the situation so requires. The MANAGEMENT TEAM are the engine room and driver of the Vision, Mission, Goals and Objectives, which comprises of young, dynamic, vibrant and visionary men whose aim is to introduce innovation to the Real estate Development and property management Industry in Nigeria. Having identified strategic opportunities in the industry, these men and women have held positions of responsibilities across various organizations and industries, proving their worth along the way. The general management of the company will be built around the EMT, which aims to encourage strong team spirits, a highly motivated workforce and a strong corporate culture of EXCELLENCE and QUALITY awareness through its business activities.We have the buying power for multiple purchases. So, when purchase of houses/lands is made through Mariam Integrated Venture Limited, organizations/individuals will save money.We want to offer what we call the Market Basket Approach to savings. We may not always offer the world’s absolute lowest price on every single property you buy, but by purchasing your entire “basket” across multiple product categories and regions from Mariam Integrated Service you will spend les. Many marketing ideas are included which, in conjunction with our prominently situated offices, our bright For Sale boards and our ever growing number of Sold boards, put us, we feel, at the forefront of Estate Agency. Our Internet site is one of the largest and most comprehensive Estate Agency sites in the country, providing ROTECH AUTOMOBILE & REAL ESTATE ENTERPRISES LIMITED and MARIAM INTEGRATED VENTURES LIMITED clients with the widest possible audience where we are able to market their property. 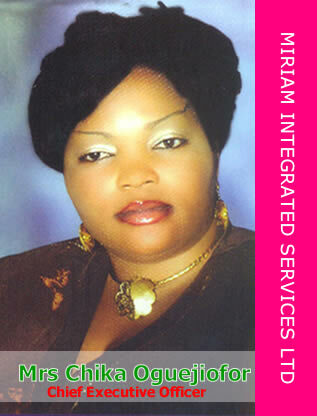 MARIAM INTEGRATED VENTURE LIMITED is headed a renowned estate and property management Guru Mrs Chika Oguejiofor. Her expirence in the real estate and oil and gas sector of the Nigerian economy has lead to her recognition internationally and locally in the field.